Sheffield Animals Research Colloquium warmly invites you to attend our research seminar, which takes place in Jessop West Seminar Room 7 from 5-6pm on Thursday 3rd March. 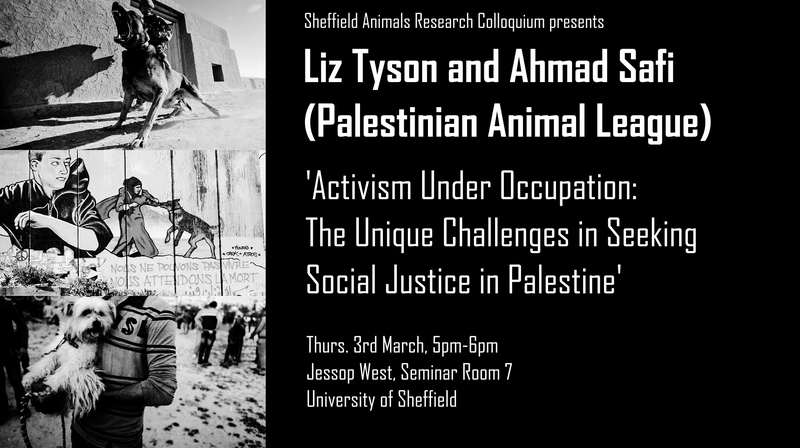 Liz Tyson (Palestinian Animal League) will be presenting a paper (co-written with Ahmad Safi) on animal advocacy in Palestine. This lecture will outline the unique challenges, dangers, obstacles and opportunities faced by social justice campaigners in Palestine. Using the work of the Palestinian Animal League and the ongoing human rights struggle against the occupation of Palestinian land as key examples of how the social justice movement manifests itself in the occupied territories, the discussion will explore how campaigning and advocacy in Palestine necessarily differs from work on similar issues internationally. The paper is co-authored by Liz Tyson, PhD candidate at the University of Essex and International Director of Palestinian Animal League Solidarity and Ahmad Safi, Founder and Executive Director of the Palestinian Animal League and long-term human rights advocate from Jalazoun refugee camp in the West Bank. Liz will present on behalf of both authors.